In 1981, a gorilla named Donkey Kong climbed to a high perch in arcades around the world, and generations of Marios have been battling him ever since. Even if you’ve put in a few-thousand barrel jumps or seen The King of Kong, there's always more to learn about the primate who changed gaming forever. 1. 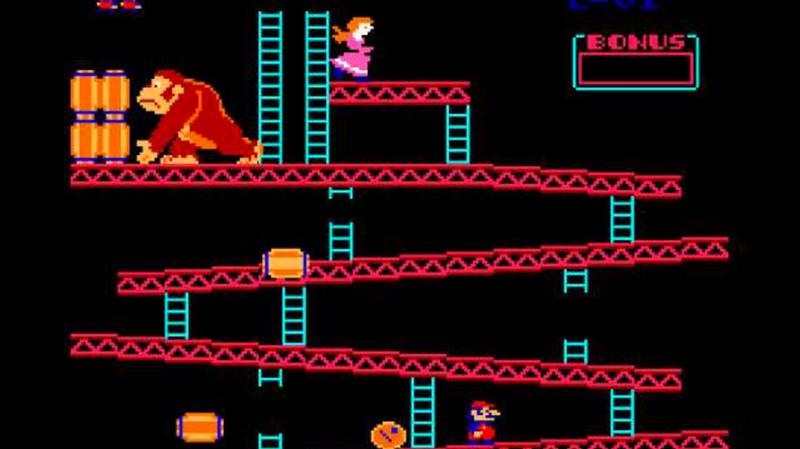 DONKEY KONG WAS MARIO’S DEBUT, ONLY HE WAS CALLED "JUMPMAN." The beloved plumber was first created for the 1981 arcade version of Donkey Kong. However, he didn’t receive his name until the game’s follow-up, Donkey Kong Jr. While rookie game designer Shigeru Miyamoto was still planning the original, the character was briefly known as ‘Mr. Video’ and as ‘Ossan,’ a Japanese term for a middle-aged man. Mario was given his signature red overalls and blue shirt—conceived as carpenter’s threads—to make his body more visible, while his cap and mustache were the developers’ best bet for making his face distinct in a time when arcade systems couldn’t yet handle hair or facial features. For Donkey Kong’s hero (and, briefly, the game itself while it was still in development), Nintendo chose the name ‘Jumpman’ because of its similarity to the popular Walkman and Pac-Man. 2. THE REAL MARIO WAS A LANDLORD, NOT A PLUMBER. During the development of Donkey Kong, Jr., a Nintendo employee reportedly pointed out that the character looked a lot like Mario Segale, the Italian landlord of Nintendo’s U.S. office. Thus, Mario was born. The original “Lady” character became “Pauline” at the same time in honor of one team member’s wife, Polly. 3. AT FIRST, JUMPMAN COULDN’T JUMP. Miyamoto: Of course you’d jump over it! (laughs) So we decided to use the button to allow players to jump and when we made a prototype to try it out, it worked really well. I think that if we hadn't allowed Mario to jump, it would have most likely proved to be a horrendously difficult game to play. In its review of the key moments in the evolution of gaming, GamesRadar gave two major hat tips to Donkey Kong. The first was for establishing the "platforming" method of designing games, which allowed players to excitingly and visibly progress upward through a game’s challenges “by pressing a single button to jump in one direction”—a quality that “is at the bedrock of gaming and will probably be a defining element of games for as long as they exist." 5. ... AND HELPED INTRODUCE PLOTS TO GAMING. Now, a fun game should always be easy to understand—you should be able to take one look at it and know what you have to do straight away. It should be so well constructed that you can tell at a glance what your goal is and, even if you don’t succeed, you’ll blame yourself rather than the game. Moreover, the people standing around watching the game have also got to be able to enjoy it. 6. A U.S. COURT RULED THAT DONKEY KONG AND KING KONG ARE TWO DIFFERENT APES. Filed in 1982, argued in a federal court in May of 1984, and concluded that October, Universal City Studios, Inc. v. Nintendo Co., Ltd. represented Universal’s demand for a piece of Nintendo’s Donkey Kong action. The game had pulled in $180 million in sales from around 60,000 arcade machines by 1982, and the studio alleged copyright infringement due to the titular villain’s resemblance to King Kong. Attorney John Kirby, Jr., who represented Nintendo (and for whom it's believed the company’s puffiest character was named, in thanks), pointed out that Universal itself had proved in the case of Universal City Studios, Inc. v. RKO General, Inc. that the plot and characters of King Kong were in the public domain. In the Nintendo case, the court ruled that Universal had acted in bad faith with the suit, had no right to the characters, and that, in any case, the studio had failed to prove that “there was any likelihood that an appreciable number of prudent purchasers [were] likely to be misled or confused as to the source of Donkey Kong” based on the ape’s and the game’s attributes. 7. THE PHRASE “IT’S ON LIKE ‘DONKEY KONG’” IS LEGALLY OFF-LIMITS, THOUGH. While Nintendo fended off Universal’s claims, the company has been careful about protecting its own intellectual property. In addition to hurling legal barrels at bootleg and knock-off versions of Donkey Kong like Crazy Kong, Konkey Kong, Congorilla, and Donkey King (some of which were officially licensed, but were supposed to be banned from sale in the United States), Nintendo applied for trademark status on the popular phrase "It's on like Donkey Kong," one which has shown up everywhere from an Ice Cube hit to descriptions of political strife, the San Francisco Chronicle notes. As of August 27, 2013, Nintendo officially owns the trademarked phrase. 8. IN FACT, THE GAME IS BASED MORE ON POPEYE THAN KING KONG. Donkey Kong did have pop culture roots. When Nintendo failed to license the Popeye comic strip’s characters, the company charged Miyamoto and his team with creating brand new characters for its next game. Miyamoto worked a carpenter, a gorilla, and a lovely lady into a sort of love triangle that mirrored the romance of Popeye, his ogre-ish nemesis Bluto, and Olive Oyl. Miyamoto said that making his Bluto-esque character into an ape ensured that there was "nothing too evil or repulsive" about the big brute. 9. THE GAME’S "HAMMER MUSIC" IS BASED ON A BATTLEFIELD TUNE. The rousing tune that plays when Jumpman wields a hammer in short bursts to knock away approaching threats is based on the ditty that battlefield buglers would play to lead the home army’s charge. There are various stories about the origins of the character’s name, but Miyamoto has said in interviews that he thought “Kong” meant gorilla, so he wanted “something-something” Kong. He picked Donkey after seeing that it meant stupid in English. It worked because originally Donkey Kong was an escaped pet, not a villain. When Miyamoto and overseeing developer Gunpei Yokoi sent the game to Nintendo of America for testing, the U.S. team was put off by its unusual title and how its structure differed from the maze and shooter games that were popular at the time. However, Nintendo executive Minoru Arakawa, who first put Miyamoto and others on the task of creating Donkey Kong, believed in the game, and the Japanese designers refused to change the name to appease prospective American audiences. Once the cabinet art and story arc were squared away, American reps for Nintendo were able to place Donkey Kong machines in two Seattle bars, and despite bar managers’ initial reservations about the game, both bars requested additional units after the first two garnered 120 plays per day in their first week. 12. ... BUT IT WAS AN UNPRECEDENTED SUCCESS. Upon its release, the game was so popular in the U.S. and Canada that after the initial 2,000 units sold out and Japanese manufacturers took too long to send reinforcements, Nintendo’s stateside representatives started manufacturing additional components to stick in Radar Scope cabinets they had on hand. By October 1981, Nintendo was selling 4,000 units of Donkey Kong a month, adding up to 60,000 units sold—or $180 million worth— by June of 1982. The game earned the company another $100 million the following year and remained Nintendo’s top seller until the summer of 1983. 13. IN 2013, A DEVELOPER HACKED THE GAME TO MAKE PAULINE THE HERO. He explained, "I was watching her and she was really bummed out [...] I have spent my career making games, and so I should be able to do something about this. That's what I do for a living. If she wants to go to the moon I can't do that, but I should be able to do this for her."